Mortal Kombat X was released last April as one of the goriest, most blood-filled video games that has ever been created. It continues to obliterate game sales to this day and in its blood soaked aftermath has left fans craving for more grotesque, shocking characters, costumes and fatalities. Well, the creators over at Netherrealm Studios have been hard at work delivering that to the fans via the Kombat Pack, a season pass that unlocks all different types of DLC content for those who purchase it. Thus far we have seen two characters by way of DLC in horror icon Jason Voorhees and classic MK Kombatant Tanya. Classic fatalities have also been added for Johnny Cage, Sonya Blade, Sub Zero and Scorpion (Toasty) respectively. Further countless character skins have been included for download by way of the Kombat Pack and patches; the most notable thus far being Pharaohic Ermac, Vampiress Mileena, Kraken Reptile and Kold War Scorpion. After all the hype surrounding the game and the success of guest character Jason Voorhees, another iconic movie legend is set to join the cast of characters. 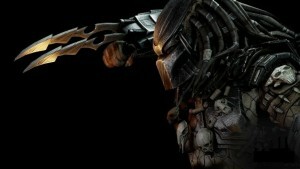 Yes, the famed Predator has been officially released for Mortal Kombat X. As any fan would guess, the Predator fits right into the Mortal Kombat X universe and has no problem dispatching opponents in Kombat. Like Jason, Predator’s special moves make him an instant favorite to use and has fans clamoring for the opportunity to have a blood-soaked match that ends with the Predator sitting knee deep among limbs and internal organs. Check out the video below that highlights the Predator’s gameplay, x-ray, fatalities and brutalities. Now if watching the Predator ripping limbs apart isn’t enough for you, fear not as more surprises are included in the Predator ‘Prey Pack’. A trio of new character skins are included in the DLC featuring Commando Johnny Cage, Infrared Scorpion and Carl Weathers as Jax. That’s right, Netherrealm nailed the ultimate Predator tribute fight by including a version of Jax based on Carl Weathers’ character as he appears in the first Predator film. Jax’s inclusion was a very nice touch to complete the Predator experience in MKX and it was just great to hear the voice of actor Carl Weathers once again in a showdown with the Predator. All the Predator DLC has been available since July 7 for those who own the Kombat Pack season pass, but it is now available to everyone who owns Mortal Kombat X via download on both the Xbox One and Playstation 4 . You can take a look at the official Predator reveal trailer below.